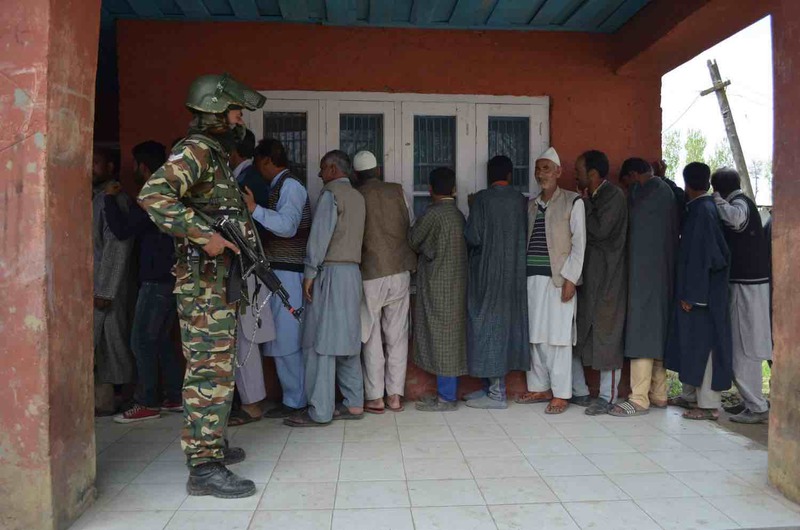 It was amid shutdown call and heightened security measures that Kashmir witnessed its first phase of polling for Baramulla Lok Sabha seat on Thursday. The unfolded scenes turned many poll pundits wrong besides creating the usual electoral din on the ground. Months of rallying came to an end in Baramulla parliamentary constituency on Thursday as the first phase of Lok Sabha elections were held in north Kashmir amid tight security arrangements with ten candidates in fray. Since early morning, long queues of voters were seen outside the polling booths in Handwara and Sumbal, while as in Sopore and Baramulla town, polling booths wore a deserted look as fewer voters turned up to cast their vote. The paramilitary forces and local policemen were guarding the streets and polling booths. An 80-year- old woman, Fazi has been an active voter for the last thirty years. She believes traditional political parties have failed to change the fortunes of people, prompting her to vote for Sajad Lone’s Peoples Conference. First time voter, Adil Ahmad from Handwara main town, came out to cast his vote after witnessing overwhelming participation of the people in polls in Handwara. He, however, has least hopes from the politicians. “I only came here to franchise my right. People have let us down. But, I cannot waste my vote. So, I decided to vote for a leader who has the caliber to deliver,” he said. The Delina polling booth in north Kashmir’s Baramulla district wore a deserted look as few voters turned to cast their ballot. “Few voters turned out to vote in this polling station since morning,” said a presiding officer at the polling booth. A complete shutdown was observed across the valley following a strike issued the Joint Resistance Leadership on Wednesday. The streets and roads mainly wore deserted look as public transport was off the roads. The shops and other business establishments were also closed.